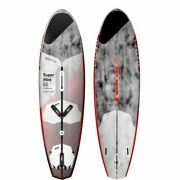 Keith Teboul: ?A new three stage rocker concept with a nice flat between the stance and a small release off the tail is allowing this board to really feel free and glide strong and powerful. Again I went with a bump diamond tail to keep some area at one foot off the tail, but have a little less in the tail to allow the board to feel more free when turning. The more parallel outline lends itself to a super stable and quick ride?. Available in 85, 95, 105 liters. Available in blue and lime on sanded white. Geared to get you going fast. The Pro Carbon S-Glass construction comes with an EPS core. DSS? Double Sandwich Stance and 0.6mm wood reinforcements for pristine rigidity around the foot straps. BCMTM Biaxial Carbon Monocoque covering the entire stance area around the foot straps for supreme heel impact resistance, S-Glass rail bands. Outside deck lamination featuring BGM? Biaxial Glass Monocoque covering the rear two thirds of the deck, full S-Glass deck. Bottom specifications featuring FBS? Full Bottom Sandwich in double thickness for ultimate strength. Inside bottom lamination featuring S-Glass rail bands. Outside bottom lamination featuring extra strong fin area reinforcements for jumping and full S-Glass bottom. Nose reinforced by 7 layers. Tail reinforced by 8 layers. This advanced performance construction combines ultra light weight, a super crisp feel and excellent durability.